packaging: Great! Cool bottle and the blade of Bison Grass in the vodka is a nice touch. about: (according to Bison Grass website) For centuries in eastern Poland, massive buffalo have roamed the lush and fertile fields that are full of rich flowers and “Zubrowka” or “Bison Grass,” an herb steeped in intrigue, mystique and romanticism. High Society would celebrate hunting successes with a special vodka flavored with “Bison Grass,” in belief this would yield grand power, increase stature and youthfulness which centuries later had been banned from American shores. my thoughts/review: For lack of a better way to describe this light green-tinted vodka, it's "grassy". Really. It is. But is also has floral and fruity notes in the finish. I find it a bit sweet, especially when mixed with mixers of the fruity variety. While it does go down fairly smooth, it is not something I will personally drink as-is (or even alone on the rocks). I do think it's a fabulous mixer, though...it seems to pair well with warm, spicy flavors. I also hear it is the perfect accompaniment to oysters. I don't know what vodka purists would think, but I think it's a great addition to the bar. Shake over ice and strain into rocks glass filled with ice. 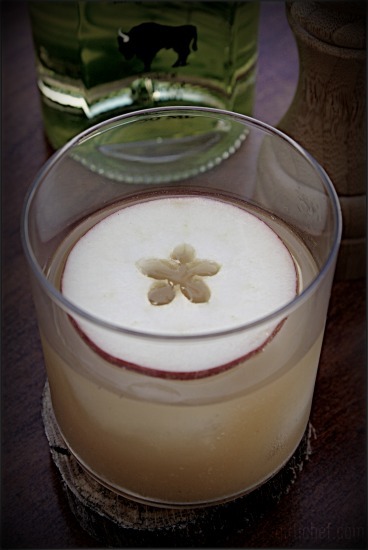 Garnish with an apple slice, if you like. 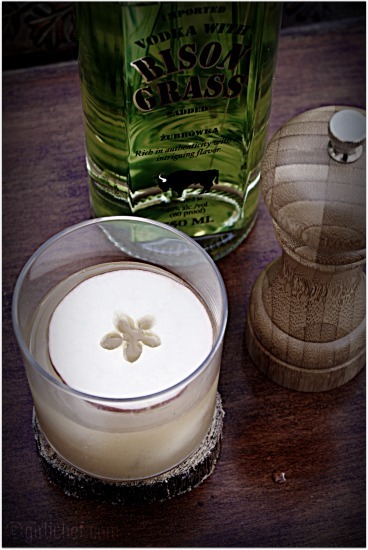 *I received 2 free bottles of Bison Grass Vodka to test/review. All thoughts and opinions stated in this post are 100% mine. Wow. Not sure I'd drink it on its own, but the Pepper Bull looks pretty good! Ohhh, this sounds so intriguing. I am definitely going to look for it around here. This is interesting. Now I want to check it out! I'm intrigued...I've never known vodka to actually have FLAVOR before! I love dirty martinis...don't know if olive juice and grass flavored vodka would produce something good though. Sounds almost as good as Bacon Vodka... Have to look for this one. Thanks for the heads up, Heather! It's funny how there are always new and weird flavors of vodka coming out, every fruit you could think of has a vodka flavor and I saw a cotton candy and a whipped cream one, now grass?!? What's next?! I have actually tried this vodka, I had an amazing Bloody Mary with it. You would think the grassy hint of flavor would corrupt the flavor, but it actually gave it this new level of delicious! My friend who made it is a master bartender too though, so there could have been other things in there that balance and complemented the vodka.